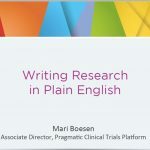 The Pragmatic Clinical Trials Platform is building capacity in Alberta’s research community by developing resources and tools for clinical trial participation, planning and management. We have partnered with the Career Development Platform to offer a Continuing Medical Education accredited program that provides clinical trial professionals in Alberta with a common understanding of resources, processes and best-practices in patient-oriented research and clinical trial conduct. We are offering the next program in September 2017, and we encourage you to check back here for more information on how to enroll. We are working on an integrated system to provide a definitive public resource for up-to-date study information. Our aim is to increase the visibility of active trials in Alberta, giving everyone the chance to participate in research. A custom application that simplifies the process for determining eligibility for active trials in Alberta. This tool will improve patient recruitment and simplify the screening process. We are engaging with Alberta institutions involved in the conduct of clinical trials to explore the need for enhanced infrastructure. We will be working with the Methods Support & Development Platform to establish the methodology and resources needed for the conduct of alternative clinical trial designs. Select the image to start the tutorial in Adobe connect. Writing lay summaries: open or download the 15 page PDF file.